Today, Magento is the best choice for CMS. This is chiefly in accordance with the fact that it provides an excellent administrative standpoint, and even the ones with little or no knowledge laymen can handle the website build using Magento very easily. An insightful, visually appealing page editor that helps the owners to build and customize their inventories with utmost ease. The option to navigate a user-friendly content management interface is suitable for those non-tech geeks who can manipulate the extreme basic functioning within the inventory and cart. Magento shopping carts are developed in a way that it is compatible, responsive, making them easily legible on all devices – smart phones, tablets, and other mobile devices. Magento gives rise to the natural flow of organic traffic. The platform is built with SEO optimization, giving your products a better search result ranking and hence giving more chance of sales. The Magento platform can support up to around 500,000 products on one site, and is able to handle more than 80,000 orders every hour. This gives a lot of space for the future growth for more than one inventories and carts on the same site. 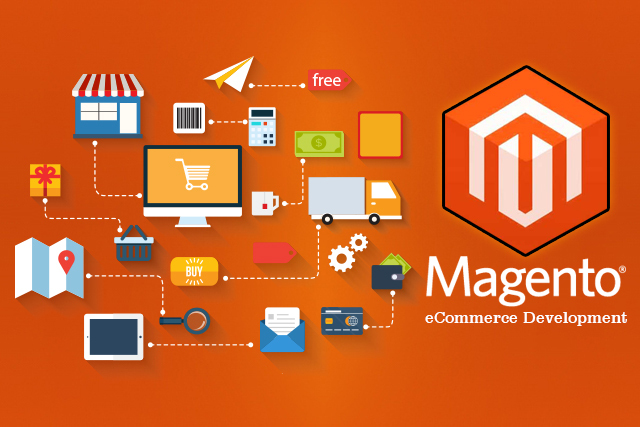 Using Magento, one can effortlessly add prompts to navigate the customers and let them browse through all the related and recommended options on product and checkout pages, thereby increasing user experience and enhancing sales potential. This gives a new arena for up selling and cross selling. With Magento, it is extremely easy to integrate your ecommerce platform with the third-party payment gateways. This way the owners can add Google Analytics and other third party integrations to their site which will ultimately help in data analysis. Magento helps you to keep your site secured by managing the internal access with the options of customizing multiple levels of security permissions. PCI Data Security comes with a compulsion and it has the login screens with CAPTCHA codes. AlakMalak Technologies with a whopping 10+ years of experience and 60+ resource strength and having the certification in Google partners, ISO certification, and D&B certification, it provides its clients with the best magento web developers who are well-versed with the development of Magento Store Development, Custom Magento Development, Custom Magento Theme Development, Magento Shopping Cart Development, Magento Extension Development, Magento Module Development, Magento Maintenance and support, and Magento Migration. The clients who hire our magento developers are highly qualified and proficient in Installation, Configuration & Customization of any Level, Basecamp Project Management tool, Dedicated Project Co-ordinator, 100% Confidentiality on NDA Execution, and Expert Advice on Request. Do I need to say more? Reach us today!